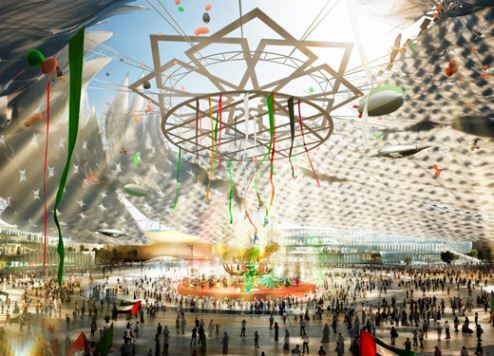 Design details of one of the Expo 2020 Dubai site’s major precincts has been unveiled. Al Wasl Plaza will be an open space that combines breathtaking design, innovative technology and an intricate domed trellis incorporating a huge immersive projection experience, according to a statement issued by the event organisers. The plaza will be a unique space at the centre of the 4.38-square-kilometre Expo site. Work on the project is scheduled for completion by the end of 2019. Al Wasl, which is 150 metres in diameter, will connect the three thematic districts – Opportunity, Sustainability and Mobility – as well as the other main concourses, including the Dubai Metro link and the UAE Pavilion, through its seven entrances and exits. Al Wasl is not only the historical name for Dubai but also means ‘connection’ in Arabic, so it reflects both Dubai’s goal of bringing people together at the Expo and the plaza’s physical location at the heart of the site, the statement said. Expo 2020 Dubai worked with world-renowned Adrian Smith + Gordon Gill Architecture (AS+GG) on the design of the space. Adrian Smith was design partner on the team that designed Dubai’s Burj Khalifa. The plaza will be topped by a 65-metre-high domed trellis inspired by the shape of the Expo 2020 Dubai logo. The trellis will act as an immersive 360-degree projection surface. As the dome is translucent, the projection will be visible to both those inside and out. Other key features of the plaza include restaurants, fountains and parks. Meanwhile, work has commenced on the iconic Expo 2020 metro station - the largest metro railway station in Dubai. The Expo station design incorporates elements inspired by the wings of an airplane. Trial runs are likely to commence in the fourth quarter of 2019 with services commencing on May 20, 2020 – five months before Expo opens.